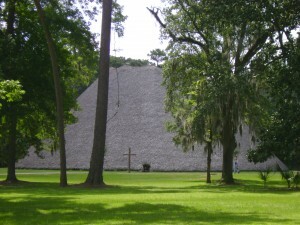 Tallahassee, Florida is home to many locations that preserve the area’s rich Native American Heritage. 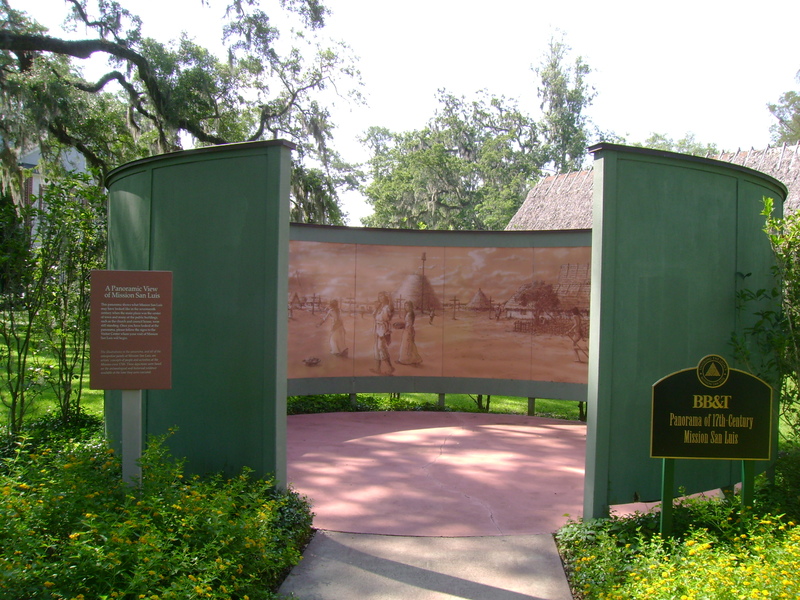 I decided to take a road trip to visit several of these sites including the Letchworth-Love Mounds Archaeological State Park, Mission San Luis State Historic Site, Florida State Museum, and the Lake Jackson Archaeological Park. My first stop was at the Letchworth-Love Mounds Archaeological State Park about thirty minutes east of Tallahassee, Florida. The park preserves what is billed as Florida’s tallest Indian mound. Upon parking my truck in the parking lot it wasn’t immediately obvious where this giant Indian mound was located. I noticed a visitor’s pavilion and thus started walking towards it when I noticed the mound in the distance covered with trees and bushes. At first glance the mound looked like nothing more than, well, a big mound of dirt. But as I got to the pavilion I saw a huge mural being installed of an artist’s interpretation of how the site would have once appeared. The “mound of dirt” was all that remained of an enormous earthen pyramid similar to ones I’d visited years before throughout Mexico. 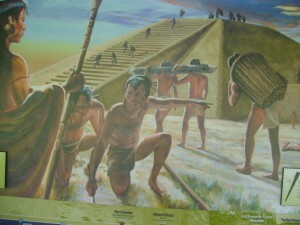 The huge mural showed an enormous pyramid with a giant ramp and flattened top where people were gathered. 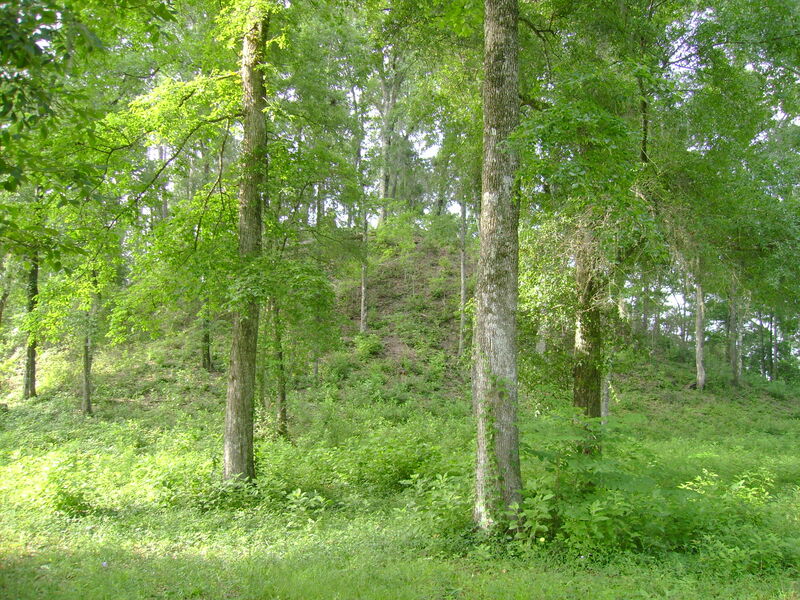 Archaeologists believe there may have once been an enormous temple on top of the mound although other researchers disagree. The visitor’s pavilion includes lots of helpful information to help transport guests back nearly 2000 years when this site was first inhabited. The mural shows the giant structure under construction and shows how the dirt for the mound was transported one basket at a time. There’s even an interactive exhibit which allows one to feel the weight of one of these baskets of earth. After feeling the weight of one of these baskets I realized the enormity of the task these Native Americans had set for themselves. 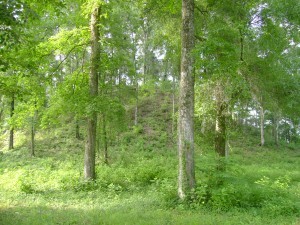 The mound is 46 feet tall and about 300 feet across at the base. 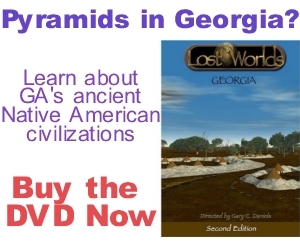 Researchers have calculated that it would have taken 14 million trips with a 20 pound basket of dirt to build this enormous earthen pyramid. 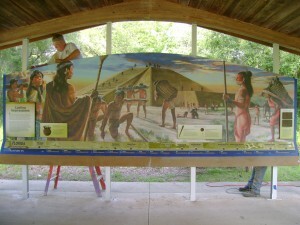 A timeline running along the bottom of the mural informs visitors that the site was first inhabited around 200 A.D. and continued until around 800 A.D. There are also examples of the pottery found at the site, known as Weeden Island pottery, which visitors can view and and even touch. Next I walked towards the huge mound itself. If constructed today this massive monument would have required the efforts of numerous people with earth-moving equipment. Even today this would require a huge organizational effort to construct thus would have required an even larger commitment of time and resources 1800 years ago. 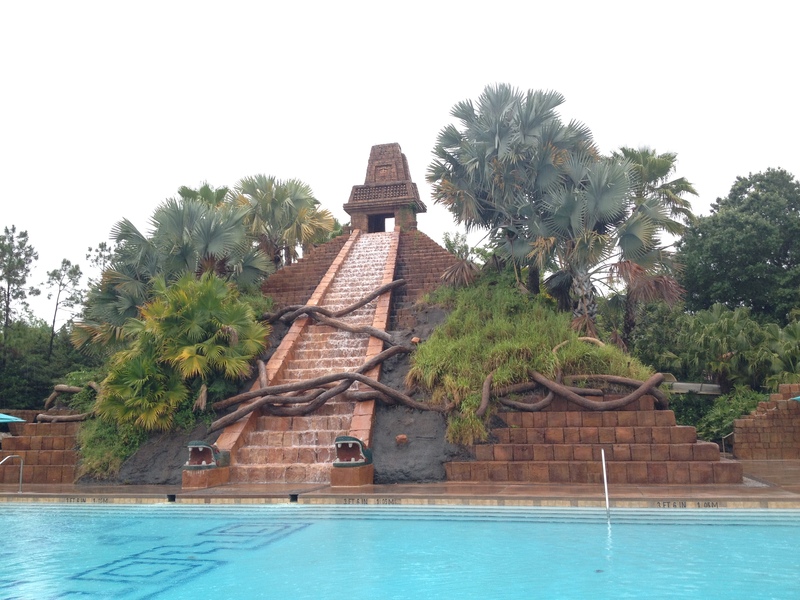 Who built this place and why are still questions open to debate among archaeologists but some have suggested Mayan traders or religious people came to Florida to open new trade networks and spread their religion. 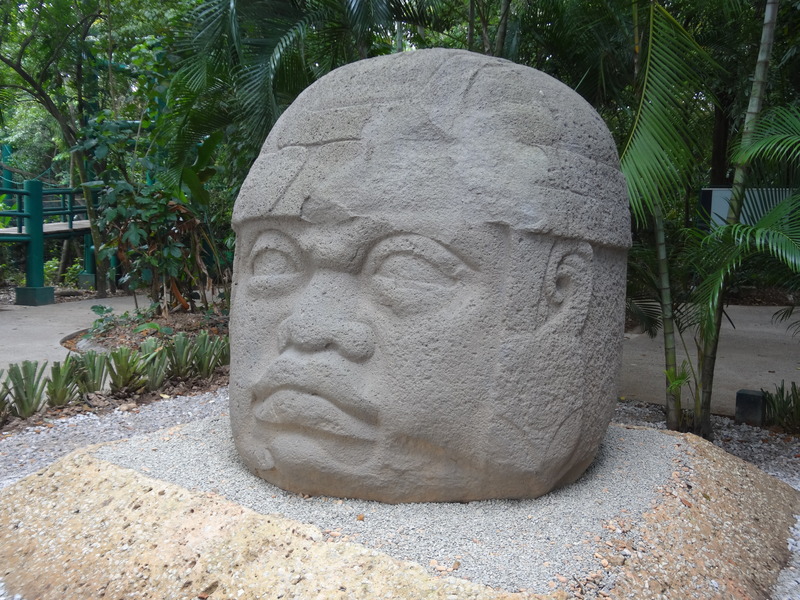 Evidence of this comes from corn, a product of Mexico, arriving in Florida at the same time and Mayan glyphs appearing on pottery in the area at this time as well. 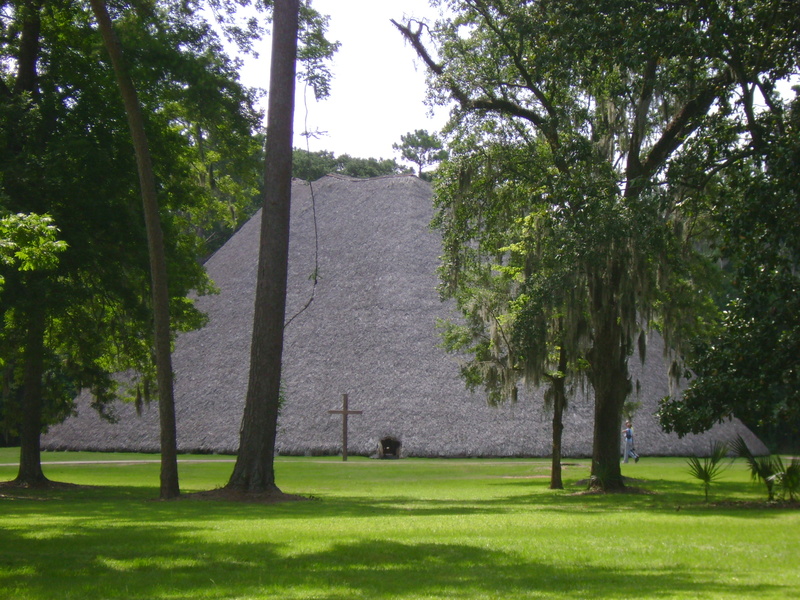 After leaving the Letchworth-Love Mounds I got in my truck and headed west to my next stop: Mission San Luis in Tallahassee. Upon parking and heading to the visitor’s center I saw the first exhibit: a 360 degree panorama of how Mission San Luis looked 400 years ago. 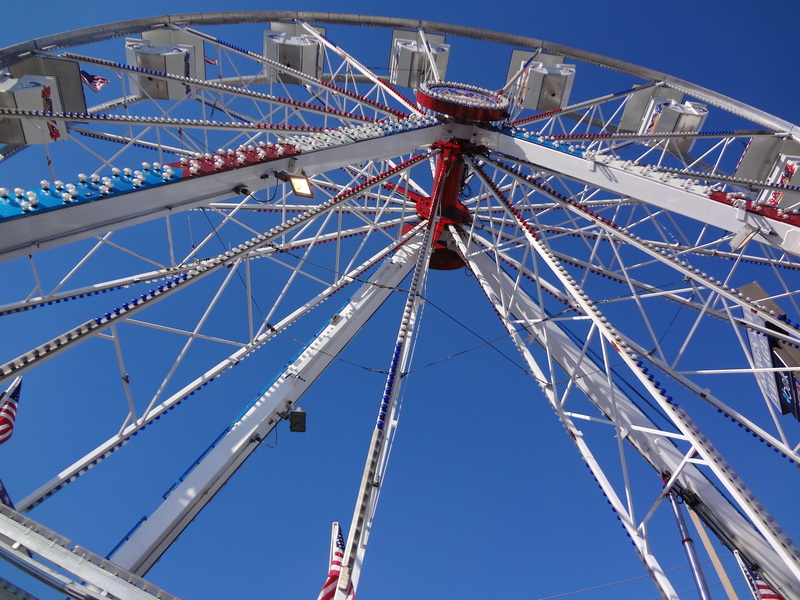 After reading a historical marker I walked into the center of this panorama and slowly turned round and round. 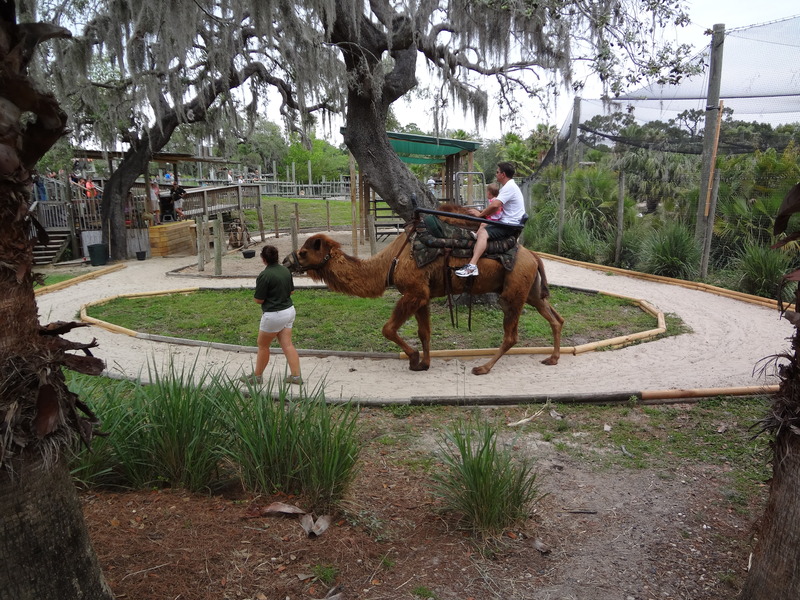 As I did so I was slowly transported back to an era in Florida and American history most know nothing about. Mission San Luis de Apalachee was a Spanish Franciscan mission built in 1633 in the Florida Panhandle, two miles west of the present-day Florida Capitol Building in Tallahassee, Florida. 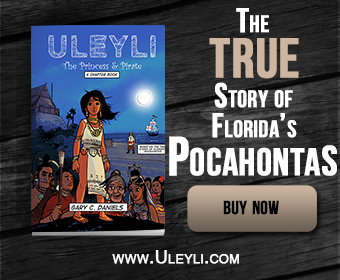 The mission was part of Spain’s effort to colonize the region, and convert the Timucuan and Apalachee Indians to Christianity. 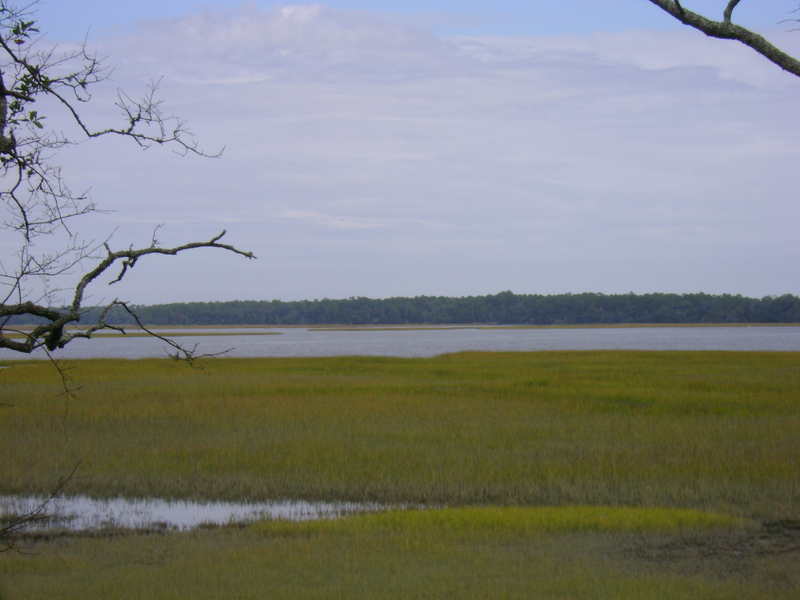 The mission lasted until 1704, when it was evacuated and destroyed to prevent its use by an approaching militia of Creek Indians and South Carolinians. 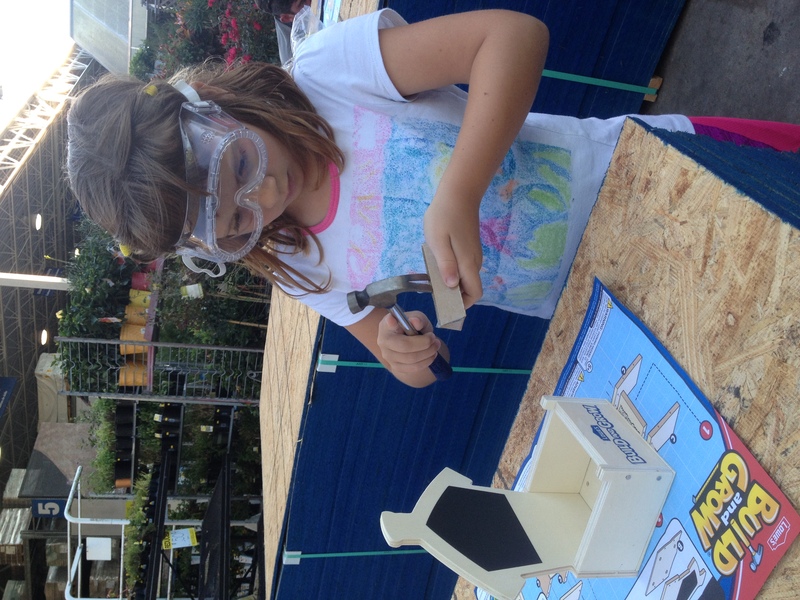 Beginning in 1996, the state of Florida began the reconstruction of many of the buildings in the mission using archeological and historical evidence to reconstruct the buildings to how they would originally have been built. The buildings that have since been reconstructed include the Church, the Convento, the Council House, the Chief’s House, the Fort and Blockhouse, and a typical Spanish House as well as many minor features around the site.